I peered at the tomb rising above me, vanishing into the dark. It was 15m high (50'! ), and covered in 8000 pounds of solid gold. Over 18,000 diamonds, huge pearls, turquoise, jade, agate, and other precious stones were embedded upon the face. For a monk, this guy did it up right. In life, he was known as Lozang Gyatso, the 5th Dalai Lama, an absolute religious sovereign. In many ways, he was the greatest of the line. Under his command the magnificent Potala Palace was constructed, which rises 300m above the Zangbo plain. And here we were, inside the Red Palace at the very top, nose-to-nose with something so priceless that it was bizarre I could reach out and touch it. The Potala Palace is one of those places that pictures and postcards simply cannot capture. Like a mountain, its enormity can only be truly appreciated when one stands at its foot and gazes up at the maroon and white face. As one ascends the long staircase past the lower ranking monk quarters, the immense thickness of the walls becomes more apparent. And it hit me, this was not just a palace. This was a fortress. Its design reminded me of Mehrangarh in India, an impenetrable castle designed to force attackers up a narrow path, where they could be easly picked off or burned in boiling oil poured from the higher reaches. Finally we reached the Red Palace. I didn't know what to expect really, but I didn't have high hopes. I'd been to too many other castles and tombs around the world, and they almost always disappoint. The riches have been stolen by thieves or museums, and the insides usually feel faded, lifeless, and gutted. So when we stumbled into the first greeting hall, my jaw nearly hit the floor. The inside was a rainbow of spectacles. From the roof hung ornate tasseled tapestries, along the back sat rows of huge golden gods with thousands of arms, eyes, and heads, demons with fiery hair, fangs scowling at us from the corner, and every inch of wall was covered in colorful golden murals showing the lives of the Buddha and all the previous lamas. The ceiling beams were painted in indigo and yellow dye created from lapiz and mustard. The smell of incense filled the air, shadows danced around cast by candles from a large golden yak butter cauldron. Offerings of money, milk, butter, and silk scarves littered the floor. The entire room was so busy and beautiful that it was difficult to focus on any one thing. But that was just the backdrop. A massive throne, and there is no other word for it, squatted ponderously in the middle of the chamber. The cushioned bench was elevated 6 feet off the floor, and every inch of this seat of power was covered in gold and precious stones. And on the seat, forlornly collecting dust, sat the mantle of the Dalai Lama. An eerie and sad sight in this room of wonders. Walking through the rooms, the place oozed more atmosphere than Indiana Jones in a lost jungle temple. Everything about the Potala feels authentic, the old wooden beams, the stone floors worn from the uncountable steps of the monks, the natural dyes used in the paint, the black yak hair knitted into huge sun screens, the colorful old textiles hanging from the ceilings, the huge gilded gods and demons, a bit dingy from the years of incense, peering out from each corner. It is almost too much to take in ... and in fact it is. Chinese wisdom has proclaimed that each tourist gets exactly 60 minutes to race through the entire length. So, in each fascinating hall and bedroom and tomb, we frantically tried to soak in the scene before being herded off to the next room. One room in particular I will not forget. 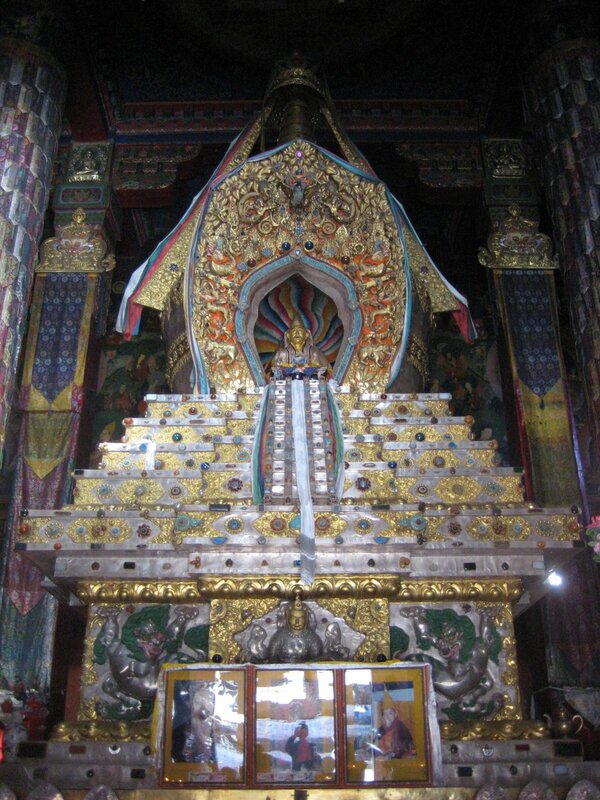 And that is the receiving hall of the 13th Dalai Lama, the last of his kind. The 14th Dalai Lama, the rock star celebrity now living comfortably in Dharamsala, India, didn't actually spend too much time in the Potala apparently. He preferred the peaceful grassy gardens of the Summer Palace in western Lhasa. And so it is the throne room of the 13th that one sees the somber end to the glory of the Potala. The throne itself is covered in enough gold to outfit at least 5 Jay-Z Bentleys, and the diamonds and pearls could have made a necklace for an elephant. I sat there and wondered about what his life had been like. 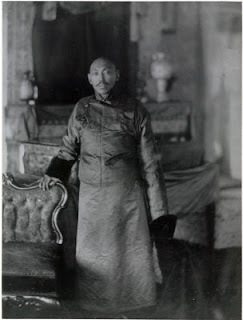 A divine king, living in such isolation from the rest of the earth that it probably seemed Tibet was the world. And then, I thought of the huge Chinese flag planted squarely on the roof just a few feet above.